When we think of the world’s polar regions, only two usually spring to mind – the North and South. However, there is a region to the south of China and the north of India that is known as the “Third Pole”. That’s because it is the third largest area of frozen water on the planet. Although much smaller than its north and south counterparts, it is still enormous, covering 100,000 square kilometres with some 46,000 glaciers. Scientists conducting research in the area have warned of disturbing global warming trends, and how, if they continue, they could affect the lives of 1.3 billion people. What happens to ice in the polar regions is taken as clear evidence of climate change. When the ice melts, we know that the planet is warming up. The Earth’s north and south extremities are crucial for regulating the climate, and at the same time are particularly sensitive to global warming. The Third Pole, because it is high above sea level, is also sensitive to changes in temperatures. It also powers life for many thousands of miles. It is estimated that the water that flows from the Third Pole supports 120 million people directly through irrigation systems, and a total of 1.3 billion indirectly through river basins in China, India, Nepal, Pakistan, Bangladesh and Afghanistan. That’s nearly one fifth of the world’s population. 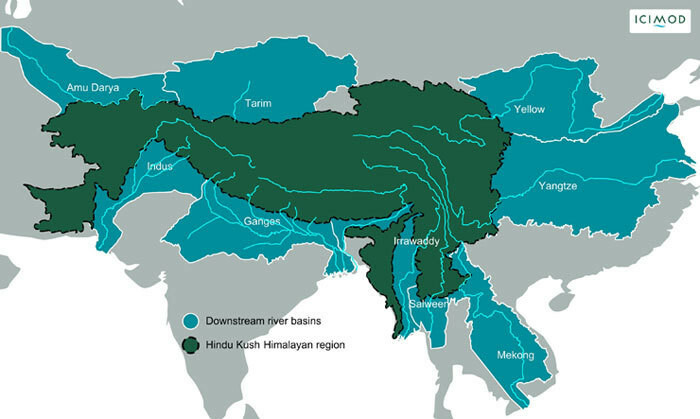 It is remote – the region encompasses the Himalaya-Hindu Kush mountain ranges and the Tibetan Plateau – but 10 of Asia’s largest rivers begin here, including the Yellow river and Yangtze river in China, the Irrawaddy river in Myanmar, the Ganges, which flows through India and Bangladesh, and the trans-boundary Mekong river. Australian TV company ABC was recently invited to visit one of the remote research stations in the Third Pole by lead researcher, Professor Qin Xiang. Scientists have been gathering data from this remote area for over 50 years, and recent findings are disturbing. Among them, the fact that temperatures there have increased by 1.5 degrees – more than double the global average. Since 2005, the rate at which the Third Pole’s glaciers are melting has almost doubled. Research has also found that more than 500 small glaciers have disappeared altogether and the biggest ones are shrinking rapidly. But global warming is not the only reason that the team found for the melting ice. Dust and pollution from car exhausts and coal burners is settling on the ice, causing it to absorb the rays of the sun, rather than reflect them away. Studying this area is difficult – scientists are hampered by harsh weather conditions and political instability – but it is crucial for understanding the impact of global warming as a whole. The Third Pole Environment (TPE) is an international research program that launched in 2009 and focuses on the Tibetan Plateau and surrounding mountain ranges. The effects will be felt much further than the area immediately surrounding the Third Pole. The continuous glacier melting will be catastrophic for the 1.3 billion people who depend on its water. While initially more water is expected to pour into river basins, causing flooding, eventually that will dry up, resulting in drought and desertification. In the end, only a reduction in black soot emissions, in addition to a reduction in greenhouse gases, will prevent the glaciers in this region from disappearing further.